Eugene Soltes, author of Why They Do It: Inside the Mind of the White-Collar Criminal, and Ian Yip, Chief Technology Officer, Asia-Pacific, McAfee, will headline the 2019 ACFE Fraud Conference Middle East, 24-26 February 2019, in Abu Dhabi. Dennis Gentilin, NAB whistleblower, author of The Origins of Ethical Failures: Lessons for Leaders and Founding Director of Human Systems Advisory will be joined by Kate McClymont, an investigative journalist, among others to address hundreds of anti-fraud professionals in Sydney this autumn at the 2018 ACFE Fraud Conference Asia-Pacific. The conference will be held 23-25 September at the Sheraton on the Park. Steve van Aperen will be speaking at the 2018 Fraud Conference Asia-Pacific in Sydney, Australia, Sept. 23-25, on how to spot liars and achieve balanced interviews. Visit FraudConference.com/AsiaPac to register. Early registration deadline ends August 23. Documentary filmmaker Bryan Fogel, who won the Academy Award for best documentary feature for his Netflix film ICARUS, has joined the list of keynote speakers at the 29th Annual ACFE Global Fraud Conference in Las Vegas, June 17-22. Martin Ford, futurist and author of The New York Times best-seller, "Rise of the Robots: Technology and the Threat of a Jobless Future," will address more than 3,000 attendees this June for the 29th Annual ACFE Global Fraud Conference in Las Vegas. An expert on artificial intelligence, job automation and accelerating technology in the workplace, Ford will impart what he's learned in his 25 years of experience in the fields of computer design and software development to anti-fraud experts from around the world. 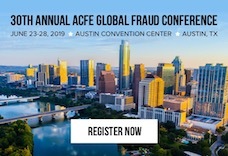 Rob Wainwright, Executive Director of Europol, will join Clare Rewcastle Brown, the investigative journalist who exposed 1MDB, convicted fraudster* Ryan Homa and others as speakers at the 29th Annual ACFE Global Fraud Conference in Las Vegas June 17-22.